Lip Shine. A twist-up lipstick in 10 intense colours. 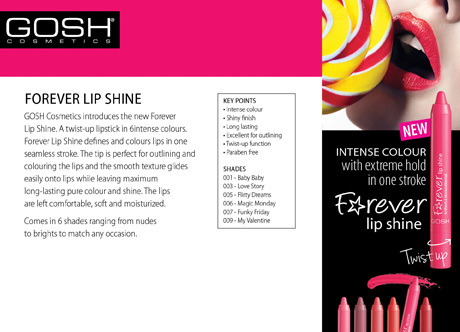 Forever Lip Shine defines and colours lips in one seamless stroke. The tip is perfect for outlining and colouring the lips and the smooth texture glides easily onto lips while leaving maximum long-lasting pure colour and shine. The lips are left comfortable, soft and moisturized. Comes in 10 shades ranging from nudes to brights to match any occasion.